Functional endoscopic sinus surgery (FESS) is the mainstay in the surgical treatment of sinusitis and nasal polyps, including bacterial, fungal, recurrent acute, and chronic sinus problems. Ample research supports its record of safety and success. FESS is a relatively recent surgical procedure that uses nasal endoscopes (using Hopkins rod lens technology) through the nostrils to avoid cutting the skin. FESS came into existence through the pioneering work of Drs. Messerklinger and Stamberger of the ENT department(Graz, Austria). Other surgeons have made contributions (first published in USA by Kennedy in 1985). By early 1990's endoscopic sinus surgery become one of the most popular surgery. On their 1990 publication. Dr. Stamberger mentioned of operating 4500 patient, roughly 450 patients annually. Most their procedures was very limited surgical procedures, diseased ethmoid compartments are operated on(usually ethmoidal bulla), stenotic clefts widened (uncinate process) and prechambers (agar nasi cells) to the frontal and maxillary sinuses freed from disease. They claimed classical triology of sinus infection is nasal congestion (can be caused by allergies also), discharge (unless it is purulent it is not a clear sign of infection), and headache (which majority of patients complaints, and differential diagnosis for migraines were unclear, not discussed). In year 2014 majority of American Rhinologist society members would not find these symptoms an indications for endoscopic surgery. Many of these patient will benefit from allergy control, frequent nasal rinsing and migraine treatments. Recently balloon sinoplasty, with the help of high reimbursement rates from Medicare to physicians is also trying to achieve same popularity. A Cochrane review in 2006, based on three randomized control trials (Fairley 1993, Hartog 1997, and Ragab 2004) concluded that there was no significant difference in cure rates comparing FESS to other treatment methods. A meta-analysis of these three studies was not used as the studies did not have a single disease staging system, a single FESS procedure or uniform outcomes measures. Fairley 1993 found no significant difference between FESS and inferior meatal antrostomy in regards to symptoms score (weighted mean difference (WMD) 1.37, p=0.6). Hartog 1997 found no statistically significant difference in cure rates at 1 year when comparing FESS to nasal irrigation alone (odds ratio 1.63, P = 0.35). Ragab 2004 found no significant difference in total symptoms score at one year between FESS and medical treatment aloneWMD 1.20, P = 0.86). Hartog 1997 found a relapse rate of 2.4% in FESS and sinus irrigation group and 5.6% relapse rate in sinus irrigation only group (RRR=0.571, NNT = 32). The other studies did not mention relapse rate. FESS is solely based on establishing the drainage pathways, other factors such as pathogens virulence, immune response and allergies are ignored. Modern rhinologist will look for irreversible mucosal damage, for endoscopic surgery indication instead of solely relying on patients headache, congestion and drainage symptomatology . Although most of Dr. Messerklinger's indications for surgery are mostly abandoned, his 2 decades of work proved that endoscopes are the ideal instruments for sinus surgery, and safe and precise sinus surgery can only performed by endoscopes. Unfortunately, balloon sinusplasty companies are trying to flare previous popularity of this mostly abandoned teaching with high reimbursement rates to surgeons in the USA. Frontal, Maxillary, and Anterior Ethmoid sinuses drain into the middle meatus. Posterior ethmoids drain into the superior meatus. Sphenoid drains into the sphenoethmoid recess. Telescopes with diameters of 4mm (adult use) and 2.7mm (pediatric use) and with a variety of viewing angles (0 degrees to 30, 45, 70, 90, and 120 degrees) provide good illumination of the inside of the nasal cavity and sinuses. High definition cameras, monitors and a host of tiny articulating instruments aid in identifying and restoring the proper drainage and ventilation relationships between the nose and sinus cavities. Cultures (putting abnormal sinus secretions into an incubator to check for bacteria and fungi) and biopsies (examining small bits of tissue under a microscope) can be easily obtained to yield valuable diagnostic information to guide postoperative therapy for optimal long term results. 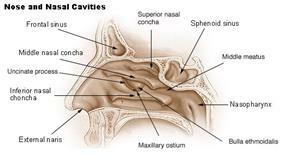 All the sinuses can be accessed at least to some degree by means of this surgery: The frontal sinuses located in the forehead, the maxillary sinuses in the cheeks, the ethmoid sinuses between the eyes, and the sphenoid sinuses located in the back of the nasal cavity at the base of the skull. Extreme care is required with this surgery due to the proximity of the sinuses to the eyes, optic nerves, brain and internal carotid arteries. However, these possible serious risks are rare occurrences and there are potentially many benefits from a well-performed endoscopic sinus surgery with appropriate indications. While a surgeon must have adequate training and experience to manage the procedure, endoscopic sinus surgery is one of the most common procedures performed day to day by the average ear, nose and throat specialist physician in private practice. Computed tomography (CT) navigation is a tool that may be used by surgeons to better correlate surgical anatomy with pre-operative CT imaging. A computer is used to identify the 3-dimensional location of a probe tip placed within the patient's nose or sinuses. Bleeding, disease processes and anatomical variants among individuals can alter a surgeon's view of landmarks during surgery. Hence, CT-navigational assistance in sinus surgery is used to improve anatomical identification and avoid damage to vital neighboring structures such as the brain and eyes. Definitive proof that CT navigation improves outcomes and decreases complications is lacking. A Swedish study of 212 patients undergoing sphenoethmoidectomy published in 2008 concluded that the clinical success of the procedure was similar with or without the use of CT navigation, and that the rate of complications might be slightly reduced. ^ Kennedy DW (Oct 1985). "Functional endoscopic sinus surgery. Technique". Arch Otolaryngol 111 (10): 643–9. ^ Stammberger H, Posawetz W (1990). "Functional endoscopic sinus surgery. Concept, indications and results of the Messerklinger technique". European Archives of Oto-rhino-laryngology 247 (2): 63–76. ^ Khalil H, Nunez DA (2006). "Functional Endoscopic Surgery for Chronic Rhinosinusitis". Cochrane Database of Systematic Reviews (3): CD004458. ^ Holy CE, Ellison JM, Schneider C, Levine HL (2014). "The impact of balloon catheter dilation on frequency of sinus surgery in the United States". Medical Devices 7: 83–9. ^ Badr-El-Dine M, James AL, Panetti G, Marchioni D, Presutti L, Nogueira JF. Instrumentation and technologies in endoscopic ear surgery. Otolaryngol Clin North Am 2013;46:211–225. ^ Tschopp, Kurt; Esther G. Thomaser (14 May 2008). "Outcome of functional endonasal sinus surgery with and without CT-navigation". Rhinology 46 (2): 116–120.